Wet Paint Nail Glaze System! This blog post is going to be loaded with pics! 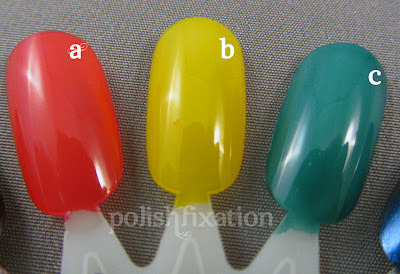 Today I am showing you the Wet Paint Nail Glaze System! 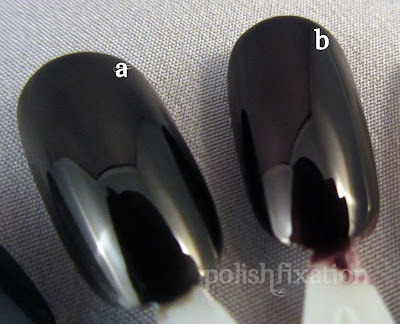 If you are unfamiliar with Wet Paint Nail polish, it's a really cool nail system that allows you to create many different looks with just a few different bottles of polish. 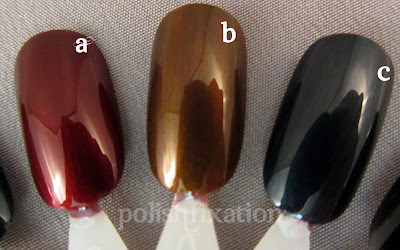 There are three different types of polishes: Bases, Top Coat Glazes, and then the extra special SPFX top coats. You can mix and match the different coats to achieve many different looks! For even more information, visit the Wet Paint Nails information page here. Kudos 2 U base color, Kudos Top Coat Glaze, Fructoes SPFX shimmer. This first picture is showing you what 2 coats of the Base color Kudos 2 U looks like. It's a smoky plum metallic color that's gorgeous even by itself. This picture is where the fun begins! I created a few more looks using the 3 bottles that are in the Fall collection. As you can see, you can mix and match the colors however you like, depending on the look you are going for. 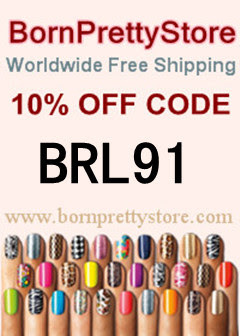 The formulas on these are all fantastic too, and even though you're layering, it never gets gunky or thick, it feels exactly the same as any other nail polish. Next up we have the Winter collection: Play Misty 4 Me! Another awesome set of looks! 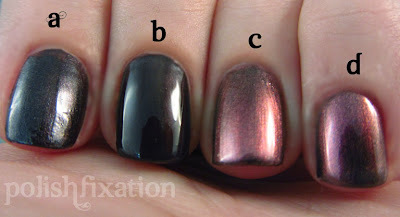 The possibilities with these polishes are seemingly endless and I cannot wait to try out more combos and see what other great shades they come out with in the future! Wow that is wild isn't it! Beautiful colors! That is so awesome, I'm gonna have to check those out! This is something new, never heard of this before but I'm in love with the shine of these polishes!! GUH!!! I'm drooling over Kudos 2 U + Willful....SO PRETTY! !